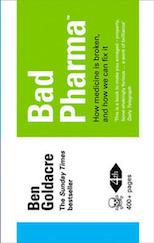 Ben Goldacre, Saturday 31 October 2009, The Guardian. Every now and then it’s fun to dip into the world of politics and find out what our lords and masters are saying about science. First we find Brooks Newmark, Conservative MP for Braintree, introducing a bill to reduce the age for cervical cancer screening to 20. The Sun has been running a campaign to lower the screening age, on the back of Jade Goody’s death at 28 from cervical cancer, and gathered 108,000 signatures on a petition. The Metro newspaper have commissioned a poll showing that 82% of 16 to 24-year olds in England agree with lowering the screening age. Science is not difficult to explain. Today we will see how British journalists go out of their way to cherry pick which evidence they cover, and then explain the risks and benefits in what has been shown to be the single most unhelpful way possible.